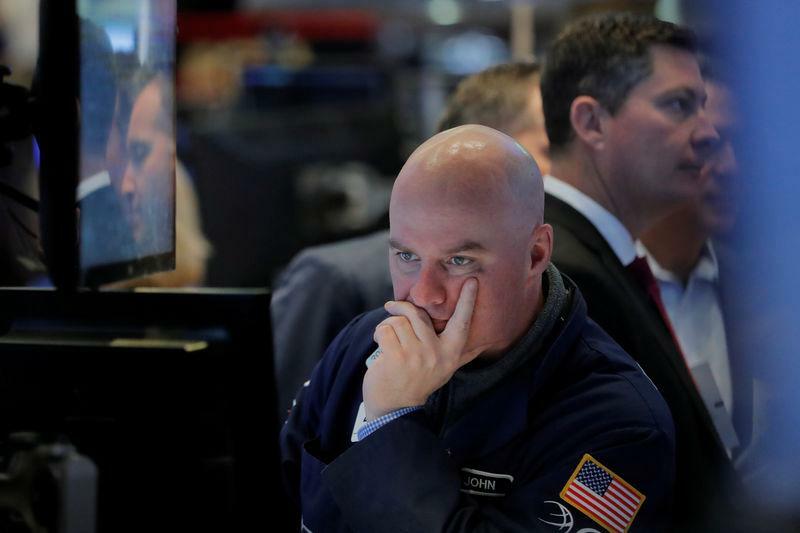 NEW YORK, 2018 - U.S. stocks joined a broad decline in global equity markets on Monday as traders turned cautious ahead of the Federal Reserve's policy meeting this week and amid continuing concerns about the threat of a global trade war. At the same time, shares of Facebook Inc (FB.O) shed nearly 7 percent after reports that a political consultancy that worked on U.S. President Donald Trump's 2016 campaign gained inappropriate access to data on 50 million of the social network's users. That decline dragged other technology stocks, which have led the market higher over the last two years. "If they start to decay, then it may leave investors wondering what's left to become the new leader to resume the bulls' advance," said Mark Luschini, chief investment strategist at Janney Montgomery Scott in Philadelphia. The Dow Jones Industrial Average (.DJI) fell as much as 425 during the session and ended won 335.60 points, or 1.35 percent, at 24,610.91. The S&P 500 (.SPX) index lost 39.09 points, or 1.42 percent, to 2,712.92 and the tech-heavy Nasdaq Composite (.IXIC) index dropped 155.07 points, or 1.8 percent, to 7,334.24. MSCI's main 47-country world stock index fell 1.1 percent in afternoon trading after European stocks dipped and benchmark U.S. indexes declined. Global equities are on their worst run since November. The drop in European and U.S. indexes came as central banks appeared to be preparing for more rate hikes. A Reuters report that the European Central Bank expects a rate hike by mid-2019 started helping the euro recover from a difficult morning against the dollar. Wall Street is looking toward the Fed's two-day policy meeting, which concludes on Wednesday, with 104 analysts polled by Reuters expecting the central bank will raise rates 25 basis points to a range of 1.50 percent to 1.75 percent. Yields in benchmark 10-year Treasuries held steady, reflecting investor rate hike expectations. After the meeting, Fed Chairman Jerome Powell will hold a his first press conference as the central bank's new chief. Analysts at JPMorgan see a risk the Fed might not only add one more rate rise for this year but for 2019 as well. "The worst case is the ’18 and ’19 dots both move up - the Fed is currently guiding to five hikes in ’18 and ’19 combined, but under this scenario that would shift to seven hikes," they warned in a note to clients. "Stocks would probably tolerate one net dot increase over ’18 and ’19, but a bump in both years could create problems." Any nod to four hikes would normally be considered as bullish for the U.S. dollar, yet the currency has shown scant overall correlation to interest rates in recent months. Dealers cite concerns about the U.S. budget and current account deficits, chaos in the White House, better growth in overseas markets, particularly Europe, and the risk of a U.S.-led trade war. Fears of a global trade war triggered by Trump’s imposition of tariffs on steel and aluminum imports cast a cloud over a two-day G20 meeting in Buenos Aires this week. The prospect of higher U.S. interest rates weighed on non-yielding gold (XAU=), which touched its lowest in more than two weeks but turned positive in later trade, up 0.3 percent at $1,317.49 per ounce by 1:33 p.m. EST (1733 GMT). Oil prices eased after ending last week with a solid bounce. U.S. crude (CLcv1) fell 0.5 percent to settle at $62.06 per barrel and Brent (LCOcv1) settled at $66.05, down 0.24 percent on the day.